(29 March 2018, Macao) The 2018 Macao International Environmental Co-operation Forum and Exhibition (2018 MIECF) is to be held from April 12 to 14. MIECF – now in its 11th edition – has won the full support of local and international environment protection industries. Representatives of local companies which have effectively expanded their businesses through the attendance at last year’s MIECF consider the event an important platform for international green exchange and co-operation. 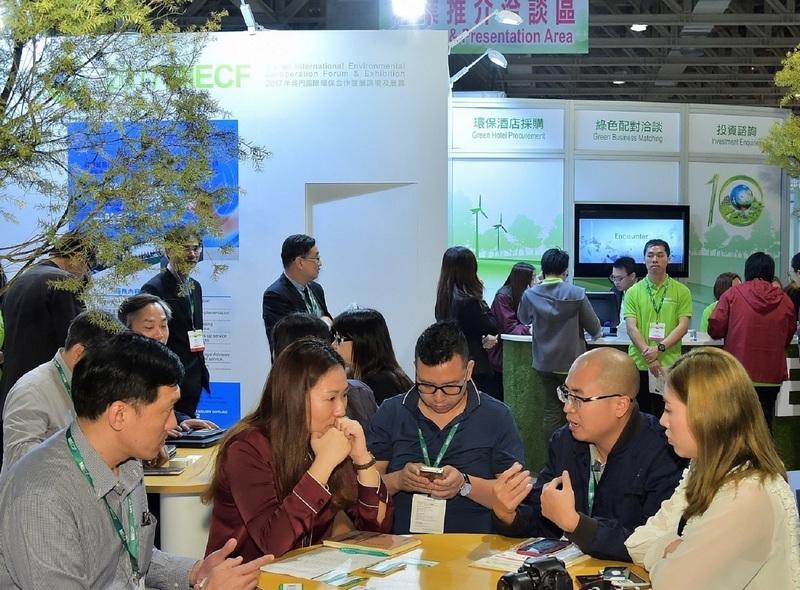 According to them, MIECF has become an increasingly prominent platform in the environment protection sector and offers participants obstacle-free access to the latest international breakthroughs in the field. Local entrepreneur Mr. António Trindade says that thanks to last year’s MIECF, he was able to establish successful cooperation on research and development in the field of smart technology with partners from a Portuguese-speaking country. His project is now under way. Mr. Trindade says that his firm has participated in every edition of MIECF since 2008 and that his business has flourished in tandem along with the event’s growth. By making good use of the opportunities created by the country’s strategies – including the “Belt and Road” initiative and the development of the “Guangdong-Hong Kong-Macao Greater Bay Area” – and based on the positioning of Macao’s development under the concept “One Centre, One Platform”, MIECF has launched different thematic exhibition areas and enables enterprises to grasp more business opportunities related to environment protection, he says. In Mr. Trindade’s opinion, aside from various green products and services exhibited at MIECF, one of the competitive advantages over similar trade shows is the on-site presentation – by exhibitors, experts and scholars from all over the world – on new green concepts and ideas, as well as the latest breakthroughs in green innovation domain. Many MIECF attendees are looking for project partners, creating abundant business opportunities, he says. Mr. Trindade says that the success of MIECF has gradually turned the event into an influential model for other local exhibitions. He believes that MIECF will bring even greater impacts as the environment protection industry continues to develop internationally. Mr. Sonny Liu, a local entrepreneur engages in environment protection business, has also participated in every edition of MIECF since its launch in 2008. He says that MIECF is a key platform for local green businesses to reach out to the global world. His company has made different achievements from past involvement, including the successful collaboration with some local higher education institutions last year. Mr. Daniel Iao is a representative of a local environment protection company, whose attendance at 2018 MIECF will mark its participation in MIECF for the fifth consecutive year . He says that the event has enabled his business to expand, particularly in relation to local projects. Through MIECF, his company has signed co-operation agreements with other local enterprises on the development of green walls and of green belts covering an area of over 5,000 square metres in residential complexes. Mr. Iao says that MIECF has helped his company grow. “Shaping of Eco-Cities for Inclusive Green Economy” is the main theme for the 2018 MIECF. The three-day event includes the “Green Showcase” exhibition area and the “Green Forum”. More information on the 2018MIECF is available at: http://www.macaomiecf.com/miecf2018/. Tel: (853) 8798 9675 (Macao) or (852) 2511 8112 / 2511 8126 (Hong Kong).